Beautifully animated and sharply written, this is an engaging, enjoyable and frequently funny family adventure with terrific performances from a superb voice cast. Directed by Peter Ramsey, Rise of the Guardians (not to be confused with Legend of the Guardians – there are no owls here) is an animated adventure based on the books by William Joyce. When evil boogeyman Pitch (Jude Law) threatens to turn every child's dreams into terrifying nightmares, the immortal Guardians – muscle-bound Russian Santa North (Alec Baldwin), boisterous Australian Easter bunny Bunny (Hugh Jackman), twinkly Tooth Fairy Tooth (Isla Fisher) and the silent Sandman – enlist the help of frustrated loner Jack Frost (Chris Pine) to help them in the ensuing battle. 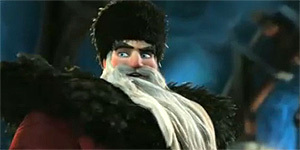 The vocal performances are excellent: Chris Pine makes an appealing lead as Jack Frost, giving him an air of cocky bravado with an underlying vulnerability (he's frustrated and upset because children can't see him) that works well, while Baldwin and Jackman are both very funny as North and Bunny, particularly Bunny's lively spats with Frost (‘Who's this? The Easter Kangaroo?’). On top of that, Jude Law makes a suitably hissable villain as Pitch, injecting exactly the right tone, while the silent but imaginatively animated Sandman manages to be an expressive and interesting character in his own right. Ramsey maintains a lively pace throughout and orchestrates some entertainingly zippy action sequences (some of which are possibly a little too zippy). Similarly, the dialogue is frequently very funny and the film carries a powerful message without getting bogged down in sugary sentimentality. That said, parents should probably be prepared for an onslaught of questions about the real-world existence of all the characters. The animation is extremely impressive throughout, thanks to some gorgeously detailed and colourful production design, augmented by some decent 3D effects. Crucially, the characters and story are deliberately global in appeal rather than obviously all-American, with character design elements (such as the bright green colours of the Tooth Fairy's costume) taken from other cultures and legends around the world; this also allows for one of the film's best moments, a cameo by a little French mouse that the Tooth Fairy explains as ‘our European division’ (this is even funnier if you've seen the delightful and charming Ernest & Celestine). Rise of the Guardians is a lively and entertaining family adventure that should appeal to adults and children alike, thanks to gorgeous animation, a witty script and terrific performances from a superb voice cast.